The BMPT ("Tank Support Fighting Vehicle"), sometimes known as the Terminator, is designed to provide support to tanks, APCs and IFVs. During the urban fighting in Grozny in 1995, the Russian army found that the limited elevation of the armament fitted to its armoured vehicles led to difficulty engaging the enemy, and so suffered heavy losses. Self-propelled AA guns such as the ZSU-23-4 Shilka were used as a stop-gap solution, but the very light armour on these vehicles made them vulnerable. The BMPT was developed largely as a solution to these problems, although it is also used in more open environments. The original design had a single 30mm cannon with co-axial 30mm grenade launcher, and four anti-tank guided missiles mounted on the left side of the turret. The BMPT-2 described here was developed in 2002 and accepted for service in the Russian army in mid 2006. 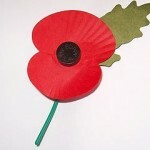 Three have also been bought by the Republic of Kazakhstan. In urban fighting, two BMPTs will be deployed with each MBT, while in rural fighting, one BMPT will be deployed with every two MBTs. 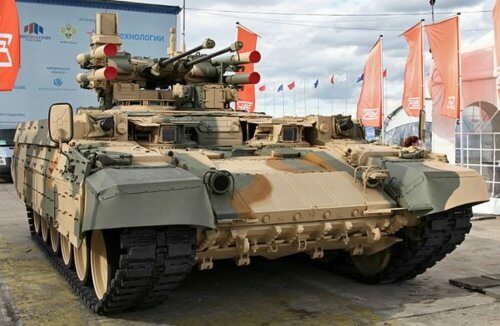 The BMPT is usually built on a standard T-72 tank chassis, though a T-90S chassis can be used. It can be built new, or existing tanks can be converted. Kaktus reactive armour is fitted to the front of the hull and the forward two-thirds of the side skirts. Grilled shields are fitted to the hull rear to provide protection against HEAT warheads, as used on infantry anti-tank rockets and anti-tank guided missiles, and a kevlar interior lining provides protection from spalling. A self-entrenching blade is fitted to the front of the hull to enable the vehicle to dig itself in to a defensive position. Fittings are included for KMT-7 or KMT-8 mine-clearing ploughs. Whether a T-72 or T-90S chassis is used, the same 1,000hp diesel engine as the T-90S is fitted. It has NBC protection and an automatic fire suppression system. The Shtora active defence system is fitted to provide additional protection against guided weapons. Shtora has a laser warning system which, on detecting a laser, automatically turns the turret to face the direction of the threat. The commander and gunner see threat information on their displays, and can choose to take countermeasures. Current countermeasure options include firing the 81mm smoke dischargers mounted on the turret, or activating a pair of electro-optical jammers. The Shtora system can also be configured to automatically fire the smoke dischargers, without manual intervention. The smoke grenades block thermal imaging as well as vision and laser guidance systems. The driver sits at the front of the hull in the centre, and is provided with a hatch that has a periscope with day and night vision devices. Behind and to either side of the driver sit two gunners, who operate a pair of AG-30 30mm automatic grenade launchers, mounted above each track. The gunners are provided with day/night sights with thermal imaging. 81mm smoke grenade dischargers are fitted to the hull, covering the frontal arc of the vehicle. The commander and turret gunner are seated under the low profile, powered turret, the gunner to the left and the commander to the right. Both commander and gunner are provided with a full set of fire controls for the turret weapons, as well as day/night sights with thermal imaging and laser range finders. 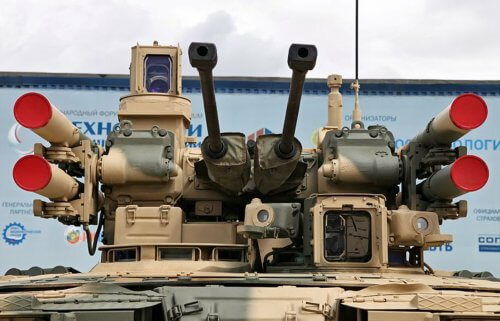 A digital fire control system is fitted, based on that used in the T-90S. The turret has a pair of linked 2A42 30mm cannons, and four AT-9 anti-tank missiles, two on each side. The 30mm cannons have elevation from -5 to +45 degrees, while the ATGM have elevation from -5 to +25 degrees. The sights and 30mm guns are stabilised in both vertical and horizontal planes. The AG-30 automatic grenade launchers have 300 rounds each. They can fire HE-FRAG and smoke grenades out to a range of 1,700m. The 30mm cannons can fire HE-FRAG, AP, API-T, APDS and APFSDS ammunition, and have 450 rounds each. The cannons have an effective range of around 1,500m against light armour, 4km against soft targets and 2.5km against helicopters. The AT-9 can be fitted with a tandem HEAT warhead for use against armoured vehicles, a thermobaric warhead for use against buildings and bunkers, or a continuous rod warhead for use against helicopters. It has a maximum range of around 8,000m, and no reload missiles are carried.